Have you tried with Vu+ original image? Try to plug this tuner in Slot 2, if I remember well this tuner is not working in slot 3 it mandatory needs to be in slot 2. I think that there is already a discussion about this on the forum. Or even try it in slot 1. Edited by Pr2, 14 February 2019 - 13:27. Then probably that this tuner type is not working with this model. IIRC the T2-tuner is quite new, so I doubt the Ultimo to be compatible with it. Latest drivers are over a year old. Look on their website, it's clearly mentioned it is ! Edited by polkwan, 14 February 2019 - 14:13. You didn't believe it but your test shows that it doesn't work, so contact VU+ and ask them. Asking Vu+ its like a rhetorical question. If he get an answer from VU+ he can play at the lottery because he will be in chance this day. Is there nobody from OpenPLi that has any contact with Vuplus ? I really don't think so. VU+ is a black box, take input never replies then a few months later reading the changelog you saw what was changed and if you are lucky your bug is fixed. 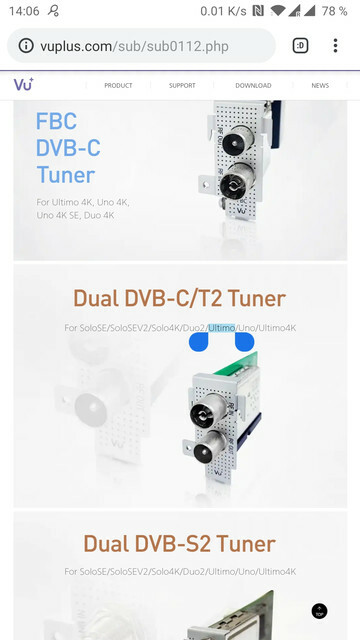 So according to you, selling a dvb-c/t additional tuner that is presented to be absolutely functional with Vu+ Ultimo is not a relevant question ? Excuse me but it seems to me as fundamental as featuring a working HDMI output or a functional wifi dongle... How could you not agree with that ? For a driver developer, no. He couldn't care less about sales. Said for you, but true. If you bought something that doesn't work, return it to where you bought it. This is exactly what I am gonna do. But what annoys me even more is the fact that Vuplus lies to all their clients ! As you can see on their website, they present it to be suitable for the Ultimo ! Edited by polkwan, 15 February 2019 - 17:27. Maybe there are restrictions to the slot you can use it in? Wouldn't be the first time.